Not only will your guests be reminiscing about the wonderful chats and laughs you shared, but thanks to some quick tips from Minwax(R) spokesperson, Bruce Johnson, they’ll remember how great your home looked, too. Mats and rugs: The sand and dirt on the bottom of guests’ shoes act like 60-grit sandpaper, wearing away your floor’s finish as they move from room to room. Protect your floors with fresh doormats and colorful rugs on each side of your doors. Plus, new rugs add a welcoming touch while instantly refreshing your space. Fill furniture nicks: Make furniture look new again by filling in marks and scratches the easy way with Minwax(R) Stain Markers(TM). Available in a wide range of wood tone colors, Minwax Stain Markers have a convenient felt tip that delivers stain precisely where you need it, making your worn furniture look virtually new again. 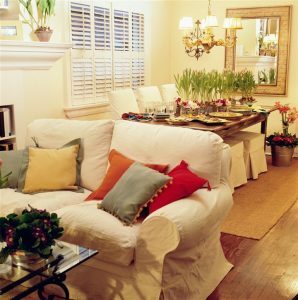 Move fragile objects: Hosting can mean extra activity throughout a home and accidents can easily happen. Rather than a friend accidentally bumping into your grandma’s heirloom porcelain vase, opt to store it for a while. Breakables are best put away when guests are over, especially when hosting large parties. Clean hardwood floors Keep your floors looking great for company with Minwax(R) Hardwood Floor Cleaner. It’s an easy to use cleaner that will gently remove dirt and grime, without leaving a soapy film behind. Protect finishes: A great way to preserve and protect the finish on any of your wooden furniture is with a coat of Minwax(R) Paste Finishing Wax, in either natural or special dark. Rub it on, let it begin to dry, then buff with a soft cloth to a semi-gloss sheen. Directions: Finicky furnace? Touchy toilet? Microwave with a mind of its own? Ease guests’ stay by posting a small note card with directions for anything that might not be obvious. You’ll make them feel at home! Set out guest towels: Overnight guests will need to shower and prepare for the day. Set out extra towels and washrags for their use either by the guest bathroom sink or on their bed. Not only is this convenient, but it also encourages guests to wipe up wet messes which will eliminate future mold and mildew growth. Protect tabletops: To avoid unintended white rings and water spots on wooden surface, apply a coat of Minwax(R) Wipe-On Poly a few days before your guests arrive. Then, set out coasters and trivets for easy use so guests stow drinks safely throughout your home. Atlantic Building Inspections has been providing Residential Home Inspections Pre-Purchase/Pre-Listing, Commercial Inspection, Chinese Drywall Visual Assessment, Mold Sampling, Four Point Insurance Inspections and Wind Mitigation Inspection to home buyers and home sellers in the Miami, Miami Beach, Coral Gables, Palmetto Bay, Coral Springs, Hialeah, Aventura, Pembroke Pines, Ft Lauderdale, Florida areas since 2000.